Earlier this week you saw the shoes. Now see the outfit. Behold, the 'Bud rocking it tribal style and making it modern with fresh pops of neon. The dress, a handmade garment made from Guatemalan cloth, and recently acquired from a nearby consignment shop, has been on constant rotation, meaning that I've pretty much worn it non-stop since I got it. And I thought a great partner to this tribal print dress would be this wonderful jacket: a geometric woven cotton coat, courtesy of MARKETPLACE: Handworks of India. The jacket is a prize- it'd be so perfect as an outer layer for the hot summer days in my hometown, Sacramento. I love the tribal yet modern look of the weave and the cut. Christened the Amrita Jacket, it's woven in lightweight cotton, has a subtle detailing at the lapels and draped side panels, which I feel, give it an avant garde appeal. For some reason, I wore the jacket belted, but I can't wait to style it on the loose, thrown over a tank top and paired with shorts and some gladiator sandals. Let me tell you a bit about Marketplace of India. 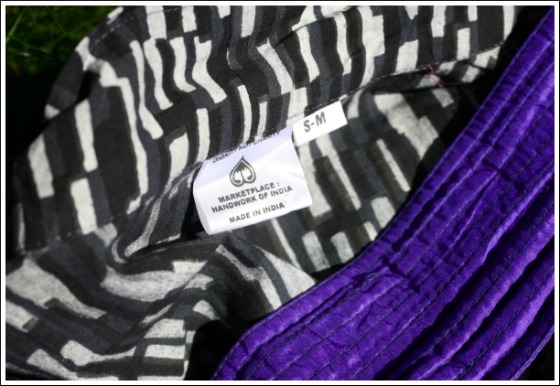 Marketplace: Handwork of India is an innovative fair trade, not-for-profit organization that fuses viable business practices with a variety of support programs designed to " effect real, meaningful, and lasting change in the lives of low-income women in India." They work with nearly 500 artisans, organized into 14 independent co-operatives and produce high-quality women's apparel and home decor. This is truly eco-friendly + people friendly fashion! In addition to establishing empowering worker co-operatives, they've put programs in place to offer educational and enrichment opportunities, designed to help the artisans overcome personal, cultural and financial obstacles. 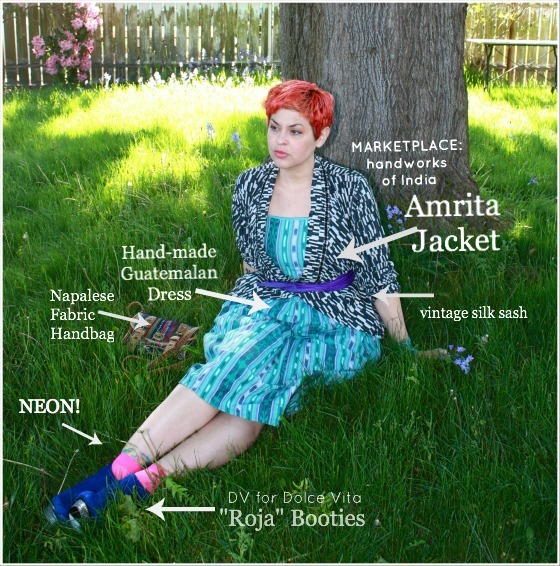 THE DETAILS: Amrita Jacket c/o Marketplace: Handwork of India, Dress from Classic Consignment, Vintage purple silk sash (for sale, just ask! ), Napali textile handbag from Krazy Mary's, Shop JUST Fair Trade bead cuff, pink neon socks c/o Steve Madden, "Roja" Booties from Nordstom. THE DRUM CIRCLE: Marketplace of India is offering one lucky reader a $100 shopping spree (via gift card) and I wonder: ARE YOU THE LUCKY ONE? Contest ends next Friday and the winner announced Monday, May 28th. Contest is open to U.S. residents only and you MUST be a Citizen Rosebud reader (think Google Friend Connect, Networked Blogs, Bloglovin') to qualify. Good luck! I love this outfit so much! Plus, you have an amazing smile. I adore the photo of you third from the top. Oops. I didn't read the bit about having to be in the US. Never mind. All my stuff is fairly traded. I buy second-hand mostly but if I buy new I check very carefully to see it's ethically made. That goes for clothes, cosmetics, lampshades, rugs, pens, everything! Bella, I LOVE this outfit!! The colors and mixed prints are so fabulous!! I must admit I'm swooning something major for your jacket. I don't think I've ever seen you looking more beautiful! Your outfit is totally rocking but your smile takes my breath away. I love your outfit so much and I'm entering. :-) Kinda lovin' on the Kapila dress in turquoise. I love your style! !The dress is amazing and so the neon glimpse at your feet, the patterns combination is brilliant and so inspirational!! Looks fantastic on you Bella! 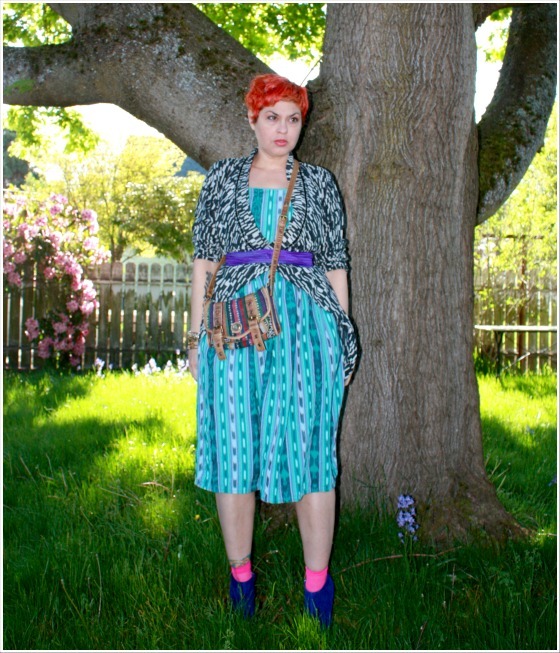 I love everything about this - the tribal, pattern mixing, and neon. If I had that dress, I'd be wearing it daily, too. 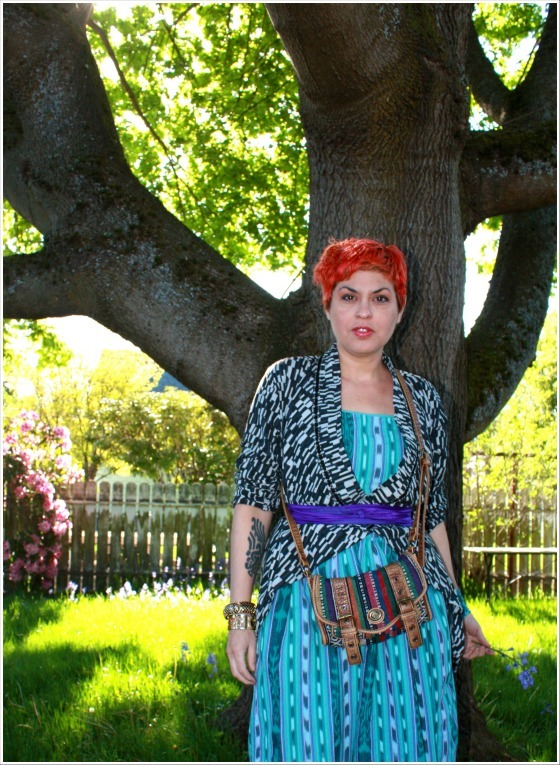 You do the tribal look with such style, and for such an amazing cause. 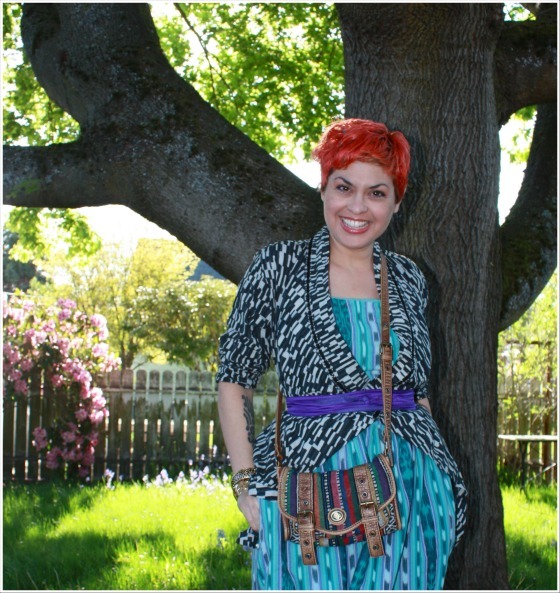 The mix of colors and prints with your hair, and that dazzling smile, are enchanting. I'm off to Marketplace of India! 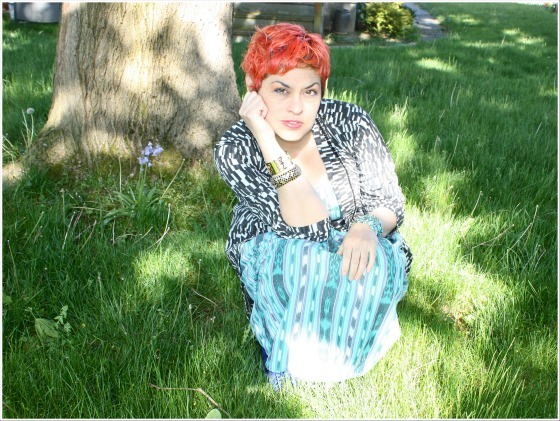 It was pleasure to interview you for my blog, and your outfit today is marvelous! As for what I would buy from Marketplace of India, it would be the Mandvi Knit Top in navy. You're all ready for Summer, aren't you? Love the prints! I follow The Citizen Rosebud on bloglovin. I have had my eye on a few things from Marketplace India, especially the Sikkim Jacket in Turquoise! Fun colors fun fabrics love the versatility, especially what one could do with the blue and white Sakina Jacket! I'm obsessed with all things tribal - prints colour... agghhhh the excitement! You look positively stunning in that first shot Miss B! Love the outfit combo and colours! Makes your hair stand out perfectly! Wishing you a terrific weekend love! Ay, Diosito de mi vida!! You look so good with some prosti slap! Tribal dress print is maravillosa, love all the little labels. your garden is magical como tu. I would purchase the Pali Skirt in Bronze and Rose for my wife. I know she would like it. Love the pairing of this jacket and dress, and the bold blue of the shoes - excellent styling Bella! Your smile in photo #3 is simply radiant! And excellent styling of the jacket and dress. I think really the most creative outfit combination. The pattern the colors the lady :). Love the jacket and the outfit. And the backyard too! How beautiful. Is it yours? love your neon socks and your hair (I know I said I love your hair many times already but i keep saying it, please don't hate me ^_^) bright colours make the whole outfit look even better. Oooooh! You too in Marketplace of India goods. You look smashing! Somehow those booties remind me of Ziggy Stardust era David Bowie. Pretty effing fantastic. And the lilacs... THE LILACS! One thing I miss from the East Coast. There is only one place I know to find them in SoCal but I always forget to go in a timely manner. Will I be lucky this time???? I'm loving this jacket, perfect for keeping the chill out. The funny thing is, I have to look for tribal clothing and accessories for work today, so this outfit of yours has definitely inspired my choices! Loved the shoes. And I love the outfit. 2nd pic of you is my fave. It's perfect!